After seeing trench coats on everyone lately, I decided to unearth mine for perhaps the most rainy day we've had around here in weeks. I picked up this floral blazer the other day at Savers and just love the color it adds to this outfit. And yes. Leggings. Because it's been one of those weekends and I can already tell, it's going to be a worse week. I love the way you put a blazer under a trench coat. Looks great! the blazer is so fun and i like it with the leggings. and oh, i don't have a trench coat but i want one so bad! The trench coat is amazing- totally on my list. I love the fabric of the blazer! I really hope you week goes well - as a consolation, I'm obsessed with your outfit. 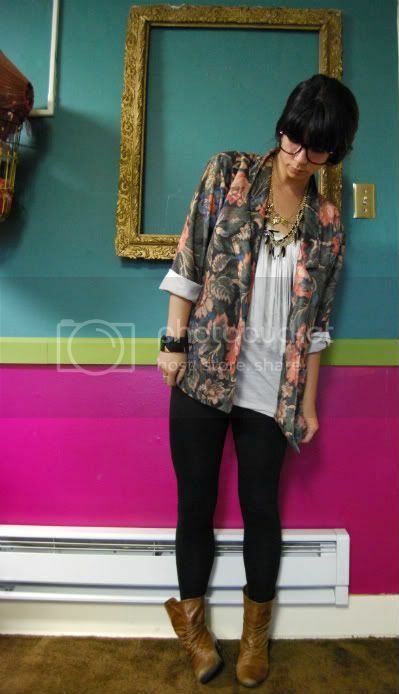 Super rad floral blazer, Krystal. Love it. That blazer is the best! where is your necklace from? i love that blazer, lovely! that vintage floral blazer is awesomely great. 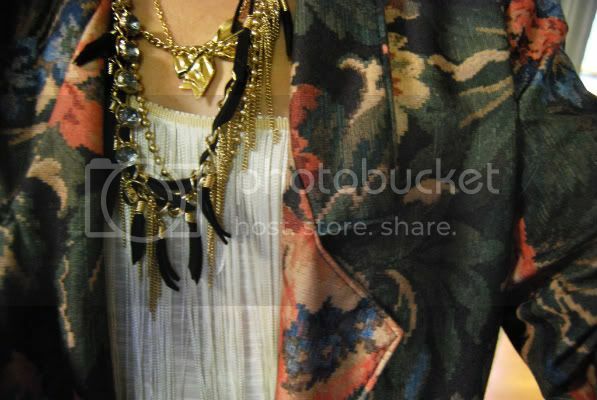 love your floral blazer and accessories!! i adore that pure white fringed top underneath it all! I really love your Style, and I like so much your outfit today! The trench it's really perfect and the boots also. Nice shirt, I love hanging tassels!! was this taken in your apartment? if so holy cow! the wall colors are out of this world!!! more photos of it please? oh yeah, your outfit totally rocks. :) hope your week goes well despite the vibes your getting! love the glasses, you totally pull them off. OMG I LOVVEEEEEEE your blazer!!!! SOooo cute!!! LOVVVEEEE both those jackets- your blazer and trench! Your blazer is gorgeous! oh wow that blazer is such a great find! i love the way you styled it too! and ps...that wall color combo is AMAZING-- love it! i have to say, i really love that wall behind you!